Punkin got his followup CD&T injection this week, which means he's now ready to become the stud at a nearby friend's farm. We're just waiting on that friend to recover from eye surgery so he can take on the handful that is our 11.5-week old buckling. Punkin is the first goat I've ever weaned, and after watching him I'd say that eight weeks old probably is too young to go off milk for most goats. Our buckling came out of his weaning at a perfect, svelte 3.0 on the body-condition chart...but that's only because he began with rolls of fat around his shoulders and because I let him nurse at slowly lengthening intervals for the first two weeks. 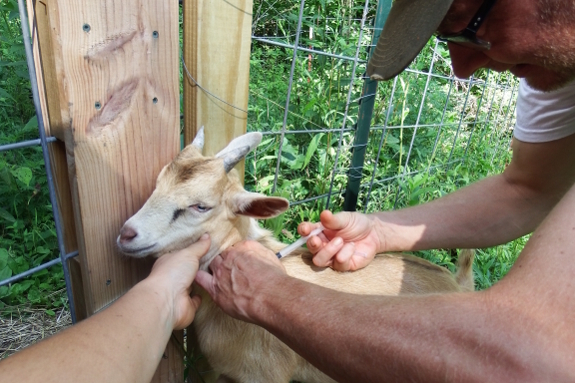 A skinnier goat or the recipient of a cold-turkey weaning would have had a much harder time making the transition to grass. 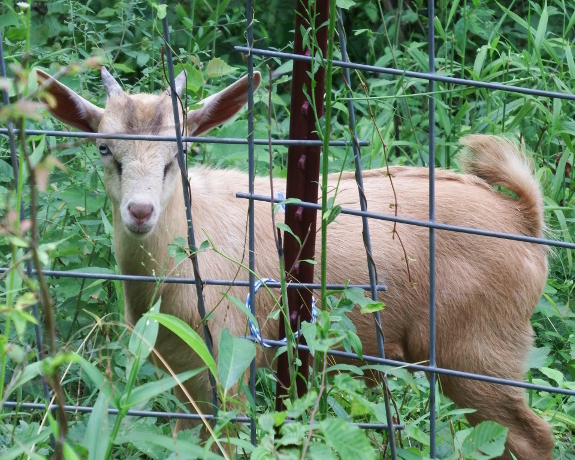 In the meantime, Punkin has gotten used to being in a neighboring pasture rather than being a true member of the herd, and he seems even more affectionate toward humans as a result of his ostracism from goat-kind. In fact, he's the most dog-like goat I've ever met. He definitely inherited all of Artemesia's sweetness and added a level of charm all his own. In other words --- Punkin's new owner had better pick him up soon before Mark and I fall any further in love! 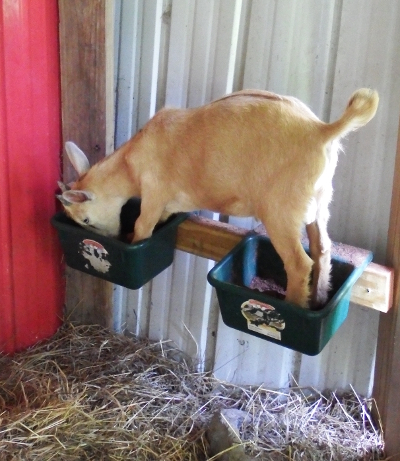 The photo of the goat standing in his food boxes is so cute!